Hey, if you have any ideas about new events, please feel free to post them up here. Thanks! Thanks guys, I will propose your ideas to the rest of the comm. , after all, the club is here for you! More competitve events, like the Krugersdorp Hillclimb. Also at least 2 proper driver instruction days, where you get taken around the track by a instructor first, and then go out by yourself. Top end event at the newly ODI will also be nice. + Treasure hunts. Something the GF can join in with. + I know this is a difficult one but has been successful in the past.. A gymkhana in a public place like closed off parking lot. This attracts alot of public and cheering ect..
Take a drive out to pilansburg(??) sit around a fire with beers and mates. Maybe go look at animals. Just a social thing. Camping, beer, food and cars are always good!!! Drive home next day. its cheap aswell. i like lady 66's idea of racing the JHB law enforcement. i remember at old hookups before wesbank , the flying squad guys would come watch and sometimes race..
Are there any events in mpumalanga close to the Nelspruit area? There are a couple of VW owners here with great VW's, but I have no idea where these people meet. 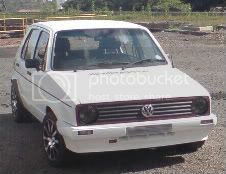 Are there anyone from the VW Club in Nelspruit area? Please leave a message so that we can get together for a small VW gathering sometime. VW's??? The only thing men really enjoy in life. VW Polo 1.6 2002 model. Now with Standard 2E Motor. 57 Stainless Free Flow Front to back. Kwaaitjie wrote: Are there any events in mpumalanga close to the Nelspruit area? Thanks for the reply. Seems to me I have to wait until I see that you guys have another Pilgrem's Rest drive or something. Then I can meet you guys there. Hope you arrange more drives through mpumalanga. We have a lot of winding roads down here and they are very scenic. I know you are going to Vereeniging for the Go Karting, but hows about a breakfast run Through to Vanderbjilpark. Already checked with the owners of Lala Manzi guest house and events venue. R50 per head for Bufet breakfast. Place is right on the vaal river. Water sports can be arranged to happen after the breafast, obviously this would be at an extra fee. what about another SPCA breakfast run? 1st warning, the vw club does not condone any sort if illegal racing, take it elsewhere!!!! Whoops guess i shoul have read the terms and conditions closely before i posted that my bad sorry.